If you walk into my study at any given time of the day, you will find that there is one program that is almost always open on my computer—BibleWorks. I use this software not only in my private study but also in nearly all of my college courses. For me, losing this software would be like losing a limb. 1. Its focus on primary texts. Sometimes people wonder why I would use BibleWorks instead of the more well known Logos. The truth is that I don’t. I use them both because they both kind of focus on different things. Logos focuses its software on building out a vast digital library. For that reason, I use it all the time, especially because I travel a lot and need the portability. BibleWorks, however, is different. The focus of BibleWorks is not to collate a vast library of books and commentaries. Its focus is on primary texts. 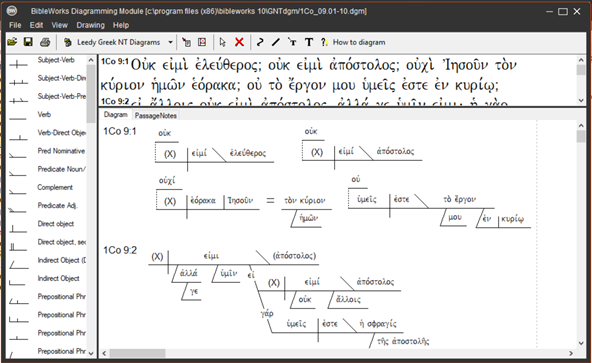 The program is designed for in-depth analysis of the Greek and Hebrew scriptures, not only in digital texts but also in a vast database of images of actual ancient manuscripts. This focus on primary texts is what makes the program absolutely essential for serious students of scripture. 2. Its speed. One of the reasons that BibleWorks stays open on my computer almost all the time is its speed. BibleWorks allows readers to perform a search on any word or phrase in scripture. It also allows readers to perform morphologically and syntactically complex searches in the original languages. This is an invaluable tool for research. And the searches are lightning fast—faster than any other software I’ve seen. The three columns are designed to be user-friendly to the researcher. When researching a particular topic, one usually moves from searching, to browsing, to analysis of particular words or phrases. The BibleWorks interface is laid out in this order (search-browse-analysis) so that reading and analyzing search results is more intuitive. BibleWorks includes a graphic interface for morphologically/syntactically complex searches. The base package already has a tremendous amount of resources, but I recommend buying at least two of the add-on modules that are available: BDAG and HALOT. One cannot underestimate the value of the two lexicons, nor the time that one will save in looking up individual words in the Greek NT and the Hebrew OT. Get them. 6. Its development through the years. 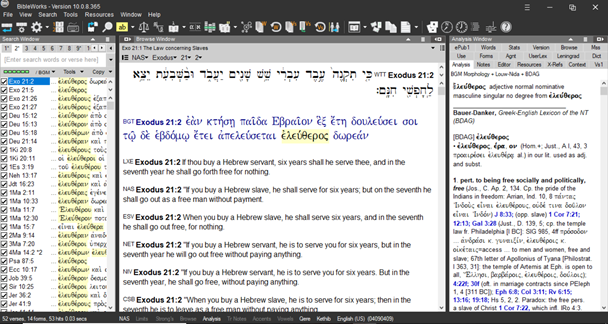 For many years, the Accordance software was the gold standard for scholars and pastors working with the primary texts of biblical studies. Its main drawback was that it only worked on Macs, thus relegating the myriads of PC users to one or more of the inferior programs that were available for the Windows operating system. 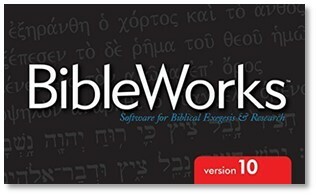 The release of BibleWorks 5 and 6 began to close the gap between Mac users and PC users. With the release of BibleWorks 7 and 8, however, I believe the gap was closed, and a new standard was set for serious students of the scripture who use Bible software. Now BibleWorks is at version 10, and it has even more improvements and functionality, and it is also available on the Mac platform. There are countless other wonderful features about BibleWorks, and I cannot catalogue them all here. That is why the news today about BibleWorks so greatly grieves me. This is a wonderful tool that and a great gift to students of scripture. Because the company is closing down, it will only be available until June 15. And they have it at a reduced rate of $199. If you are a serious student of scripture and you don’t have this tool yet, I can’t recommend it highly enough. Visit www.BibleWorks.com to purchase and download.